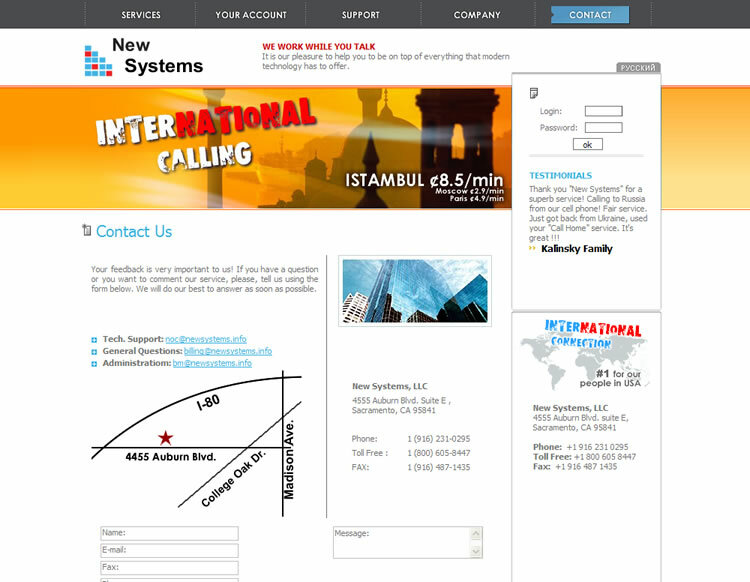 New Systems offers a cut edge technology of voice and data transmission. Their services will lower your monthly costs and increase efficiency. Some of the services are: local, domestic and international calling, international private networks for branches in different locations, high speed Internet access, Local Access Networks and Wide Area Networks design and implementation, web hosting, collocation and programming. 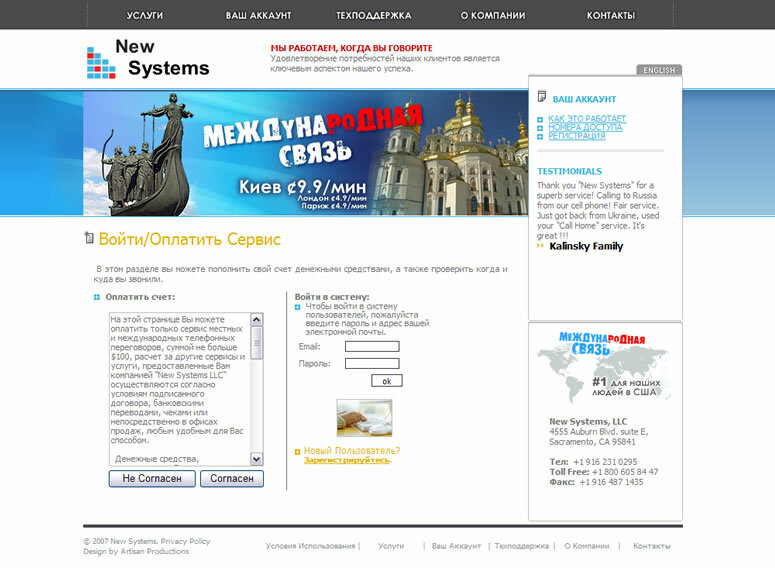 Task: Redesign and reorganize an existing website to make it easier for the viewer's eyes, enhance browsing experience, create a second version of the site on Russian language. 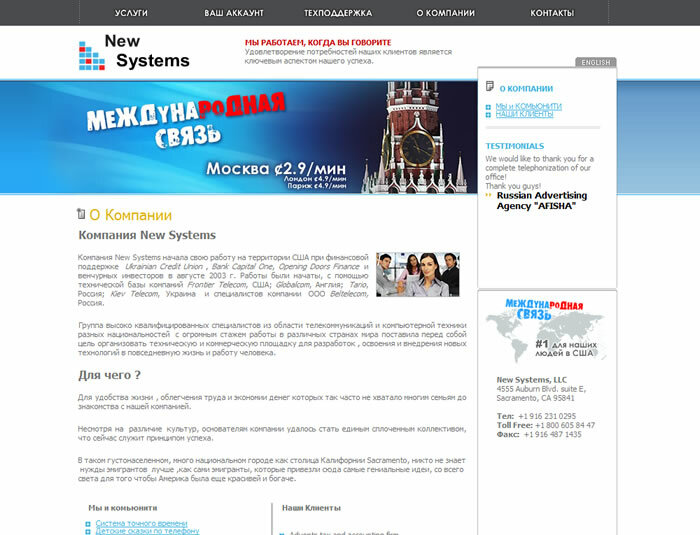 Macromedia Fireworks, Action Script, PHP, DHTML,SSI, CSS. 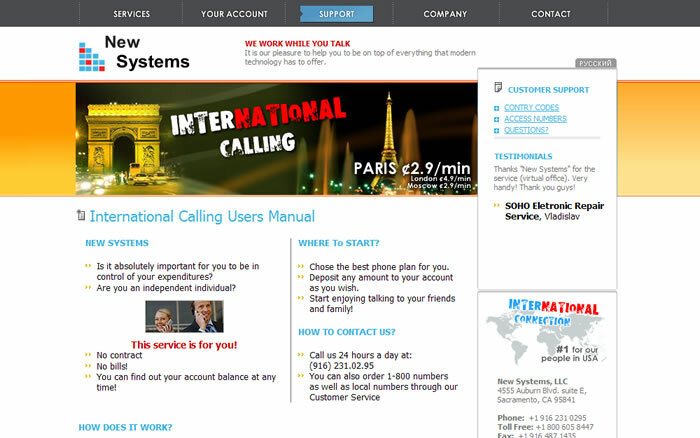 We are a telecom company that was in need of an attractive, catchy and at the same time informative website. A price quote received from Artisan Productions was very competitive. At first, we were skeptical about it because of the really bad prior experience with a few other local web design companies. Basically, we’ve seen a lot of templates and no creativity at all. Artisan Productions was like our last resort. Conference meeting with designers was straight to the point, they knew what we wanted and most importantly how to achieve it. quote Drafts were presented to us in an acceptable amount of time; they took their time to create a design that is really authentic. We loved it! Our new website has got everything we were looking for such a long time. Amazingly, Artisan Productions designers were able to explain every item on a website from the customer, usability and marketing points of view and that just blew us all away. We’ve never expected to get such a professional looking website. 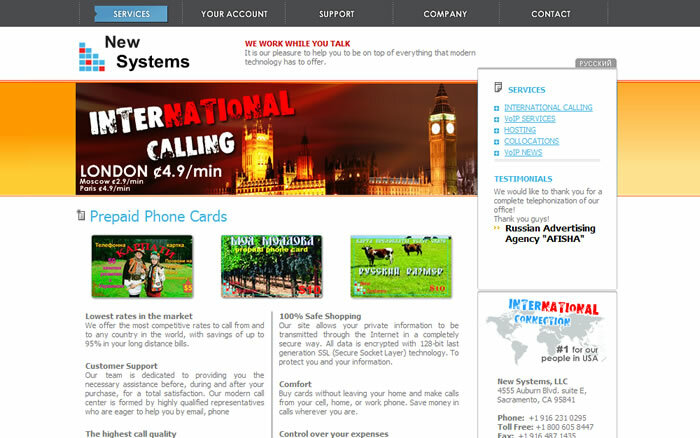 The most important of all, the site really works from the business point of view. These guys are highly experienced professionals. 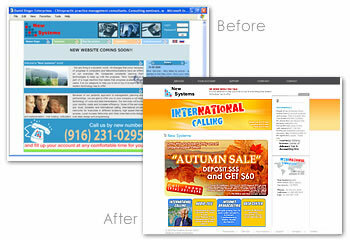 They really work with you to create a custom website and not a clone using templates. After the web site was ready, we’ve purchased a website maintenance plan and now every update, event or sale appears on our site in no time. 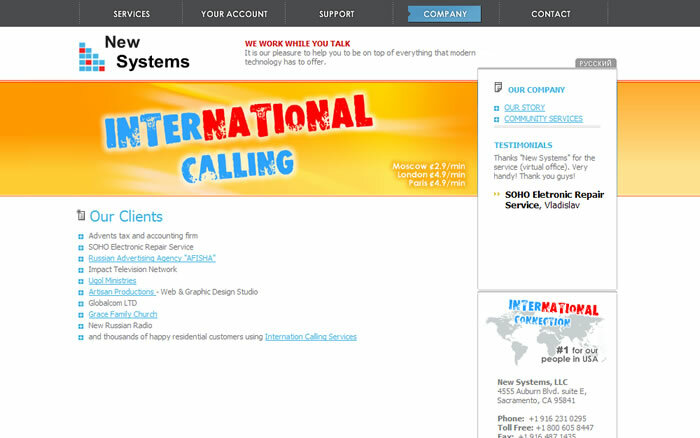 Our company is 100% satisfied customer of this Sacramento web design company. 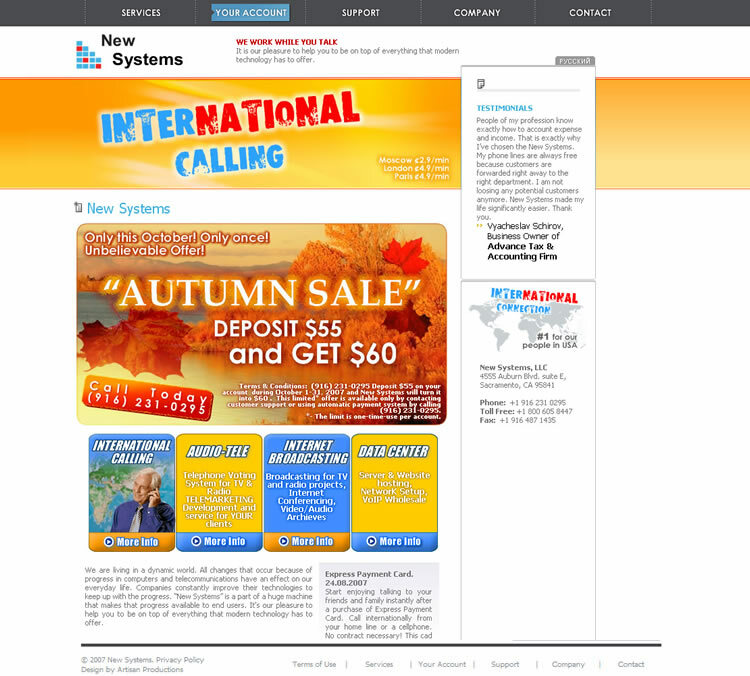 SOLUTION: We've taken New Systems' existing site and reorganized it. After adding a little of dynamic content, Artisan Productions spiced the website up with a few VoIP RSS feeds, added more interesting, related to Sacramento community, content. The Russian version has the same consistent look but got a blue color scheme instead of the orange one which is used through out the English pages. This helps a visitor feel secure and develops trust in the company by visually demonstrating stability.